The Parish Council’s prime role for Roads and Transport is as a statutory consultee for documents issued by Buckinghamshire County Council (BCC), Central Government, and Chiltern District Council (CDC). The Parish Council’s only direct responsibility is for all street lighting in the Parish, except for those lights on the A416, which BCC provided and maintains. The Parish Council tries to represent the views of residents about Roads and Transport matters to BCC, and others. We do this by having regular meetings with BCC officers, keeping our County Councillors aware of the problems and needs of the Parish. We also participate in special meetings and workshops organised by BCC, respond to all consultations, and request BCC to repair defects to the roads and undertake routine maintenance. Buckinghamshire County Council (BCC) is responsible for all the roads and footpaths in Chesham Bois, (and surrounding areas), except where signs designate them as private roads or paths. BCC’s responsibilities include providing new facilities, maintaining roads and footpaths, and co-ordinating the activities of all the organisations that dig holes in our roads and footpaths. BCC now manages all “on street parking” and employs the parking enforcement attendants. BCC also has significant responsibilities for the provision and coordination of all Bus Services in the area, including Schools Transport. BCC discharges all its Roads and Transport responsibilities through a joint company with the private sector called Transport for Buckinghamshire (TfB). BCC and TfB have a joint, and extensive website, www.transportforbucks.net which includes a lot of useful information about current and future work, policies, bus timetables, and systems for reporting defects to roads and footpaths. This is the best starting point to find out what is happening about Roads and Transport in Chesham Bois and the surrounding area. Chiltern District Council (CDC) is responsible for providing, and managing the “off street” car parks in the District, and for the cleaning and sweeping of all the roads and footpaths in the Parish. The Parish Council’s primary role in Roads and Transport is to press the case for improvements in our Parish, usually to BCC. Successes are hard won. In 2012, lobbying and pressure by the Parish Council created a new pedestrian crossing in Bois Lane. This is a huge benefit to the children who attend Elangeni, Chestnut Lane and the Village Schools, as well as to residents. This demonstrates that working together we can make a difference. The Parish Council is keen to hear your views on Roads and Transport issues, and in particular areas where you consider maintenance is required. Such information will enable us to put forward stronger arguments for work to BCC and our County Councillors. Please e-mail, or telephone the Parish Clerk, or send a message via the form on our Contact page. Use of High Wycombe-based social enterprise group Tool Shed for tasks such as grass cutting, sign cleaning, weedkilling. Useful and good value for the Parish, whilst also giving young people the chance to develop work skills and experience, learn about Health & Safety etc. Chesham Bois is blessed with no fewer than five primary schools. Consequently, large numbers of children are walking to school and crossing roads during the week. Speeding drivers endanger the lives of children, so we are investigating several options, including more speed signs, the Community Speed Check scheme and Police involvement. Most drivers are considerate and keep within the speed limits. However, our speed monitors show a minority drive at reckless speeds, at all times of the day. 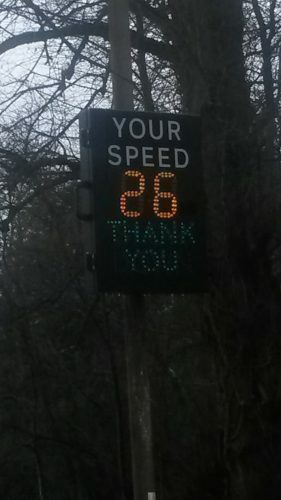 In response to residents’ complaints about speeding in the Parish, the Council has acquired a mobile speeding sign, which records and displays vehicle speeds. The first location for the sign was North Road. Recorded speeds in North Road for the initial 3 month period showed 69% of vehicles travelled past the sign below 30mph. However, 217 vehicles were recorded at more than 40mph, including one dangerous driver at 68mph. The following 3 months saw an improvement in recorded speeds. We, therefore, believe that the speed signs are an effective tool in reducing speeding, as they make the driver aware of the speed they are travelling. 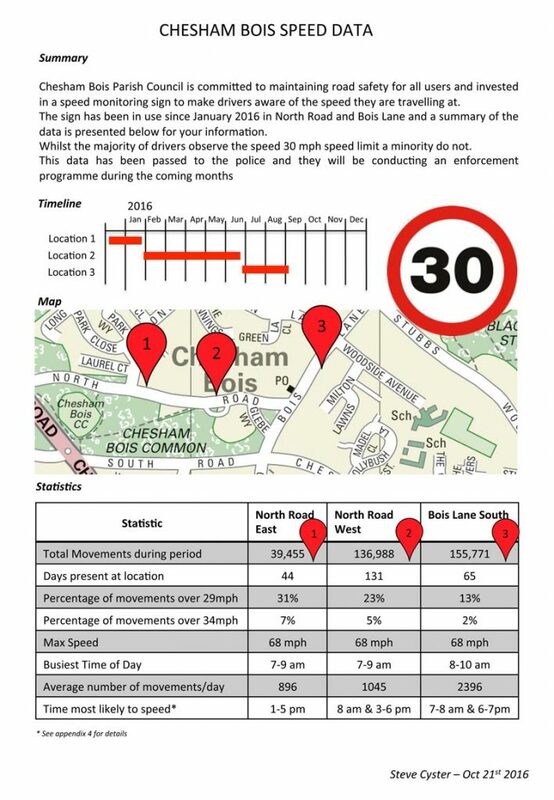 The Council will monitor the speeding statistics at each location. The Parish Council provides and operates all the street lighting in the Parish, except for the lighting on the A416, which is the responsibility of Bucks County Council. A significant part of the ‘rates’ (Community Charge) paid by residents to the Parish Council is spent on street lighting. In round terms electricity and maintenance of the lights each cost approximately £2,000 every year. The electricity charge has, not surprisingly, increased considerably recently. The Parish Council has therefore been pushing manufacturers hard to develop suitable LED lamps, which, if successful, will reduce electricity consumption by around 75%. We now have two such lights operational in Holloway Lane (one opposite the northern end of St. Leonard’s Road and the other at the end of Runrig Hill). The second of these was only installed in February 2012. We are now evaluating their performance, and your views on them would be much appreciated. If the LED lights are successful the Parish Council is intending to develop a plan to replace all, or most of the lights in the Parish with LED lamps. We anticipate we will change the lamps to LED’s in batches, when the current lights need replacing. We are also investigating if grants are available for such a projects. Please let us know if you are aware of any sources of funding. Clicking on a street name will reveal a list of the street lights in that road. Find the relevant street light and click on it. This will open a new e-mail message with the specific street light already named in the header.